Tiger and Elin Celebrate Sam's Birthday Together! Home » Tiger and Elin Celebrate Sam’s Birthday Together! Photos have been released today of newly divorced couple Tiger and Elin Woods celebrating their daughter Sam’s 3rd birthday together on June 28th. 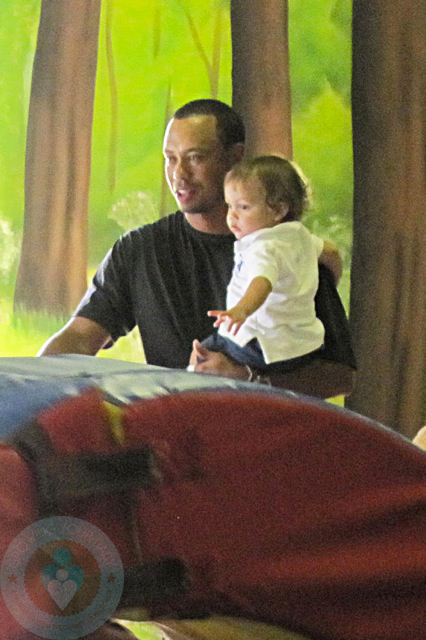 While at the party, which was held at Cranium Clubhouse in Orlando, Florida, Tiger could be seen carrying his son Charlie around as well as watching his daughter Sam go down a big inflatable slide. It is nice to see that Tiger and Elin were able to put their problems aside in order to celebrate an important day with their kids.